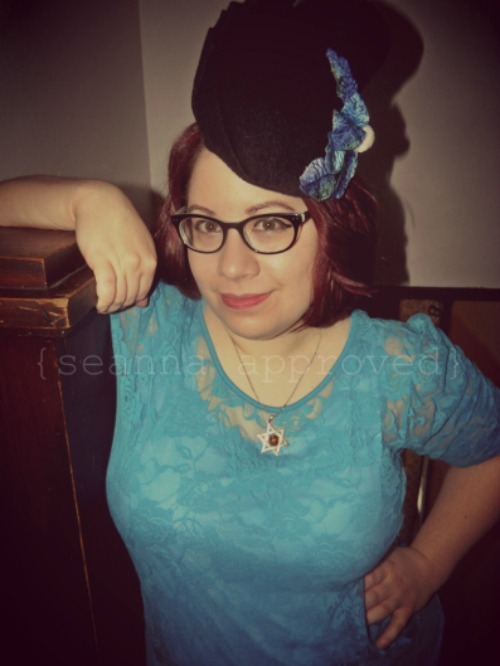 My take on a 1940s "Small Chic Beret"
The internet abounds with ridiculously gorgeous images of vintage hats. I could spend hours drooling over them (and sometimes do) and dreaming of being able to make something so beautiful. 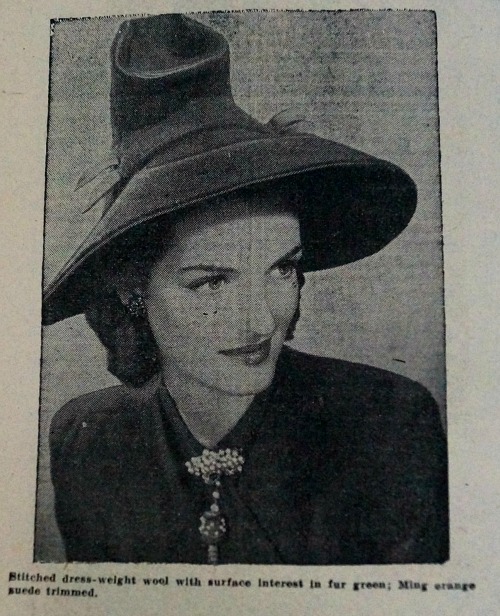 Generally when I see a fabulous vintage hat, I add it to my mental "I want to make this" list. Hats rarely make the transition from this list into reality, but here is one that did. This design was inspired by the so-called "Small Chic Beret" illustration from McCalls Needlework magazine (Winter 1942-1943) which was scanned and shared by Brittany over at Vavoom Vintage last year. 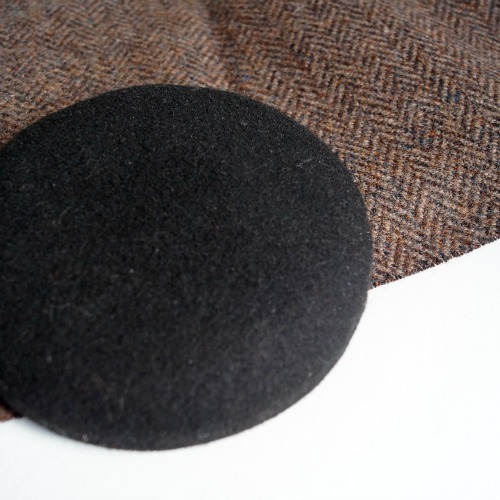 While the original would have been a flat pattern hat to be sewn from fabric, mine has the fabric draped over a blocked wool felt button shape. 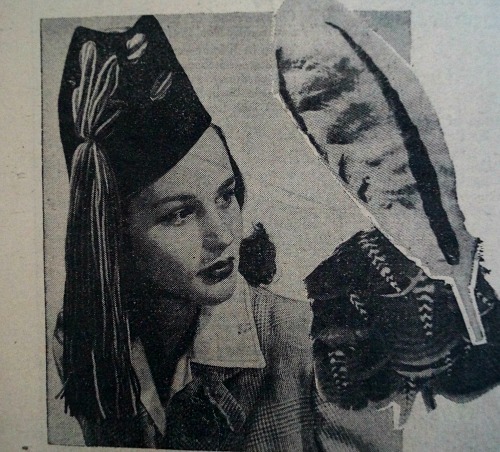 The other main difference is of course the feather, which here is made from wool felt again. I played around with some alternate angles for the hat, but in the end decided that McCalls knew what they were doing, and kept to this orientation. 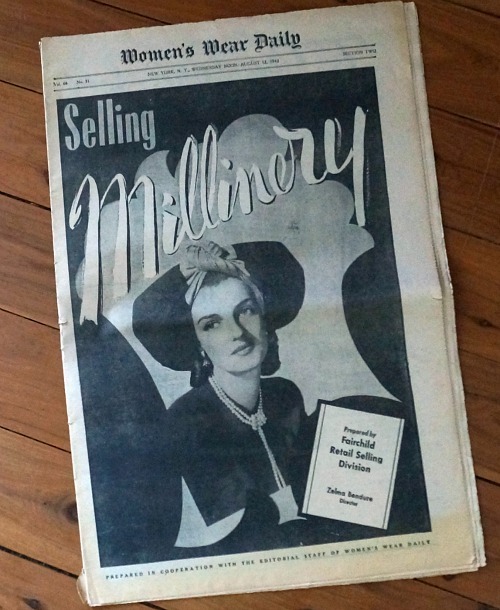 There's that Selling Millinery supplement again! And my new-to-me Dobbs hat box, which was a Christmas or Birthday present from my mum. Speaking of both the Trefriw Woollen Mills and my mum - big news! My family and I will be going to Wales again this year to visit! (My mum. But also hopefully the Mill.) We're a bit anxious about Teacup's first international flight and potential jet lag, but also very excited about the holiday and all the exciting things we will get to do. The trip should be a mix of adventurous activities for my husband, quiet wandering around nice villages and sitting in cafes and parks for me and Teacup, and toddler-friendly activities for all of us. Teacup and I will be staying on an extra week with my mum, when we'll get to do the things we love, like Woollen Mills and historic houses and shopping. If you have any suggestions for great things to do in North Wales or the surrounding area, I'd love to hear them! Even now, when hats are not the necessary addition to an outfit that they once were, hat styles go in and out of fashion. 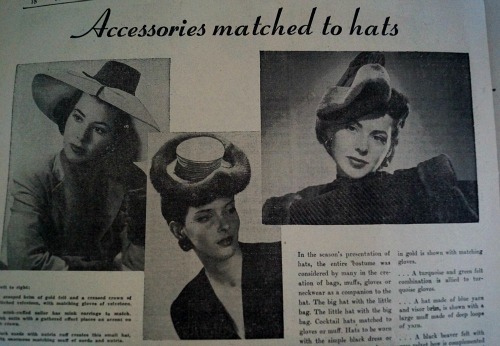 Back in 1942, the change was more rapid and the options for hats - the style, the materials, the trims - were more numerous. Having trawled through so many issues of the Australian Women's Weekly, I suppose I assumed (if I thought about it at all) that magazines and their brief fashion reports were the place to go to keep up with the changing fashions. For most women, it probably was. Until I saw this newspaper section (and more like it) for sale on Instagram (via adelinesattic), it hadn't occurred to me that there might be a trade publication to distribute this knowledge directly to the sales girls who would have been working in so many hat shops and department stores, and needing to seem up-to-date on all the latest modes. 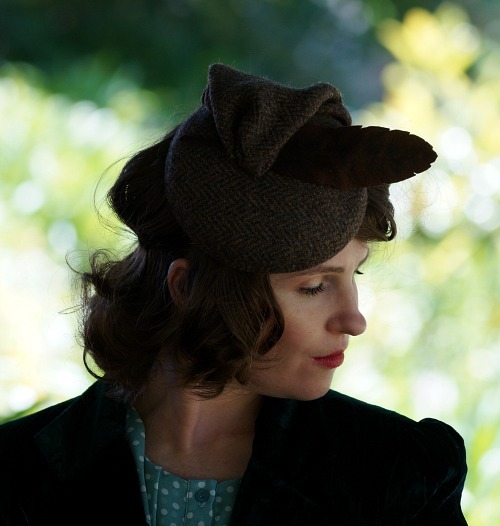 I bought two sections on millinery, one on gloves (for my sister as a Christmas present) and one on Christmas selling. So far I have only read this one, here and there as I eat my breakfast and my husband laughs at me. Reading this was a really fascinating way to get a thorough look at the fashions of the times, not just in images but in detailed descriptions of the styles, materials, colours and trims, along with when and where they might be worn and with what. Add to that some entertaining ads and commentary along the way, and you've got a good read, in my opinion! The war is frequently mentioned, not just in relation to "priority-free trims" and so on, but also in discussing the needs of your customer. "These "after five" hats will achieve the purpose for which they were created. They will lift the spirits of the wearer and of those who see her, for a few precious hours, into a mood of gaiety and relaxation not to be forgotten by the men when they return to duty." They also influence the styles in fashion, with patriotic loyalties leading to style being influenced by "our Allies in the present conflict", leading to Chinese and Russian styles, for example, and peasant motifs from Norway and France, and military colours are also popular. 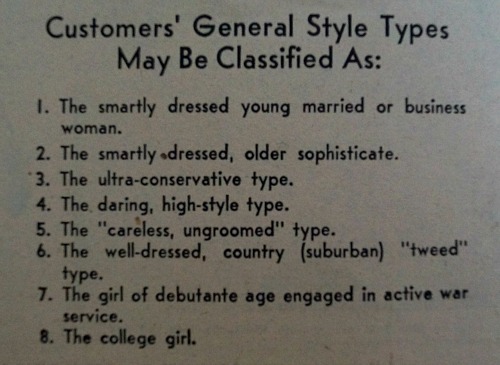 The section on Customer Types is fabulous, with not only figure and face shapes, but also a "general style type" based on her personality and lifestyle. Which of these do you think you are? I can't decide, or perhaps I'm just in denial. 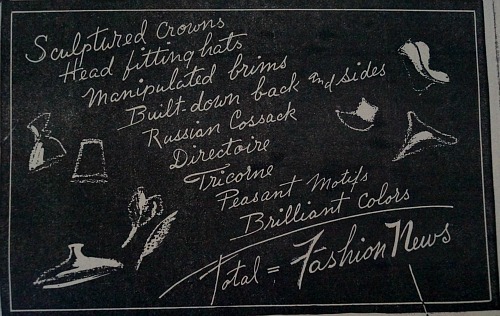 Following this are thorough pages on felt, woven and knitted materials and those "Priority-free Trimmings", though in general the season is apparently bringing fewer trims as the style lines of the hat take centre stage. 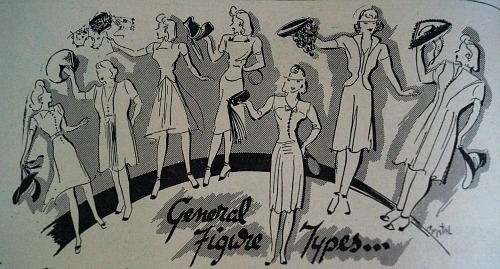 As is often commented on by those who sew their own vintage reproduction garments, the range of fabric types available to us is so reduced from what it was in previous decades, with many materials described that you would be unlikely to find anywhere today, and certainly not easily. I'm torn on this turban. 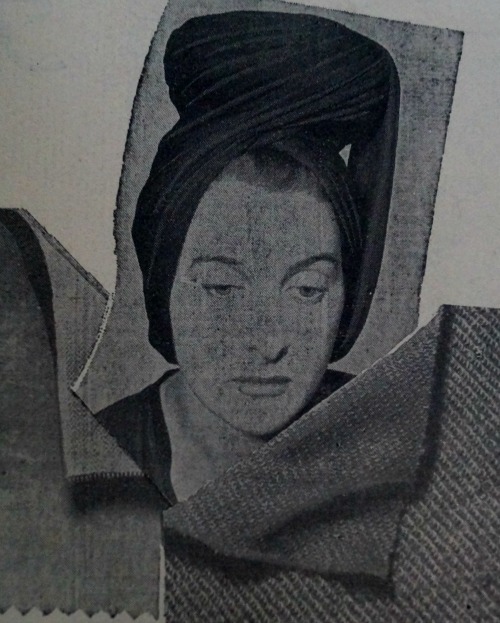 It's kind of stunning, but it also makes me think she has put a bowl on her head and then wrapped it up. I think my life has been missing matching accessories for my hats. Another 2016 goal! "Fashion leaders always turn there backs on a fashion before the point of saturation is reached. And when little bows and wisps of flowers are seen perched on the heads of women and girls of all ages and interests, you may be sure that bareheadedness is on its way out. 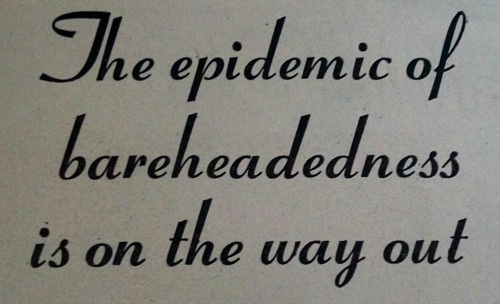 This epidemic which has swept the country has affected not only juniors and girls of college age, but their mothers as well...Outdoor living, casual clothes, slacks suits all had their effect on the acceptance of this fad." For shame, women of America!! 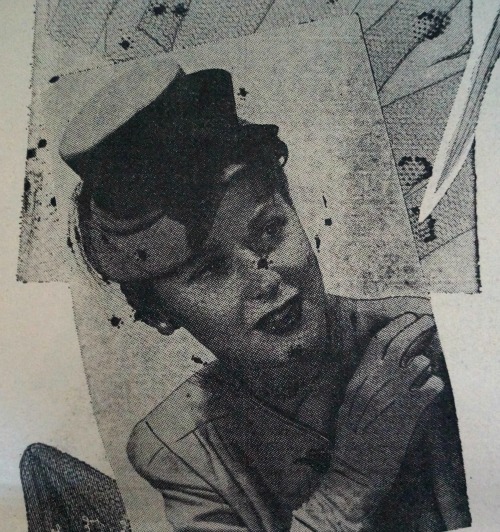 I, of course, love little frippery things as much as large hats, but I feel the writers of the above were due to be disappointed in the 50s and 60s as heads were adorned with whimsies and things like the Butterfly Cap. And even more so if they saw in the later decades. 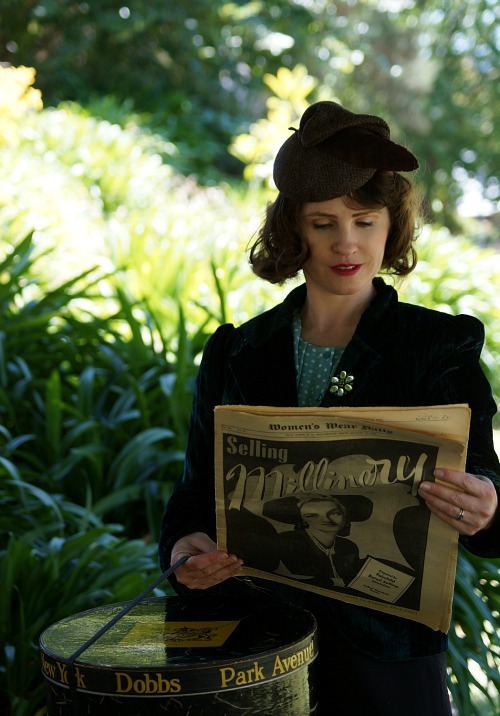 Well, I hope you've enjoyed these snippets and insights into selling millinery. If you like, I'll catch up with the other two sections in later posts. To all those who sell hats, remember, "You sell more by being gracious", "You sell more by being enthusiastic", and "It is better to lose a sale than sell the wrong hat, because the customer's friends will criticize it, and she will not admit it was her choice". Can you believe it has been over a year since Adelaide started travelling the world? 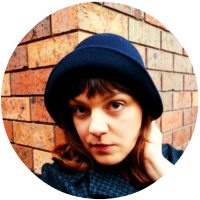 At the end of last year she stopped off to stay and get to know the lovely and friendly Seanna and feature on her blog, Seanna Approved. 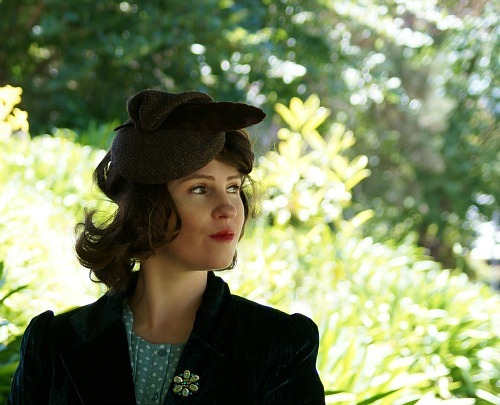 Jump on over to Seanna's blog post to see more of her gorgeous images in the hat and say Hi! Adelaide has moved briefly up to Canada and you should be seeing more of her shortly.